I’ve mentioned in a few past posts that this year was my first year trying my hand at gardening! I’ve shown some recipes I’ve made using basil and scallions from my garden and here is a great recipe I’ve been making from my zucchini plant! I actually made this recipe with a store-bought zucchini prior to starting my garden this summer. The zucchini from my garden are so much larger than the store-bought zucchini! This recipe is actually quite simple. Grease a baking pan and add the zucchini to the pan. Add the mixture to the boat. Cook any extra meat mixture in a side dish as a casserole. Cook until the zucchini is soft. This has become one of my favorite meals! It also makes a great freezer meal for the crock-pot. 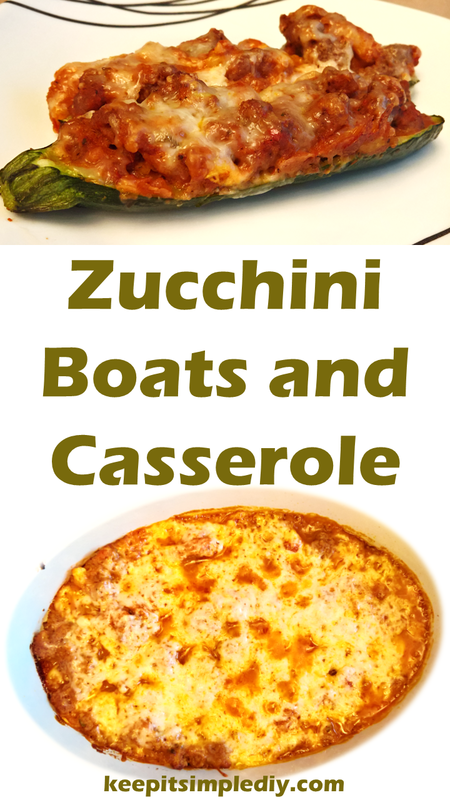 For the crock-pot variation, I chop the zucchini instead of making boats. I pre-cook the meal and add the cooked ground beef, chopped zucchini, breadcrumbs, seasoning, and cheese to the freezer bag. I put the marinara in a sealed sandwich bag prior to adding it to the large bag with the rest of the ingredients. When I’m ready to make the meal, I let the bag sit out long enough that I can get the ingredients out of the bag without difficulty and I add everything into the crock pot together. The general rule of thumb is 8 hours on low or 4 hours on high. I am a HUGE zucchini lover. These look delicious. What?! You grew that in your garden?! Wow, talk about putting store bought zucchinis to shame! This recipe looks delicious by the way. Trying this one out for sure! Yes! I grew about 8 that size! It’s as long big as my cat!